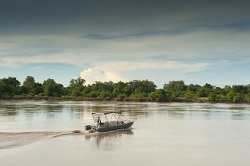 Nkwali Camp accesses the Park directly from camp by boat all year (via a pontoon 10 minutes away used mid-May – mid November), or by the main bridge some 20 minutes away. 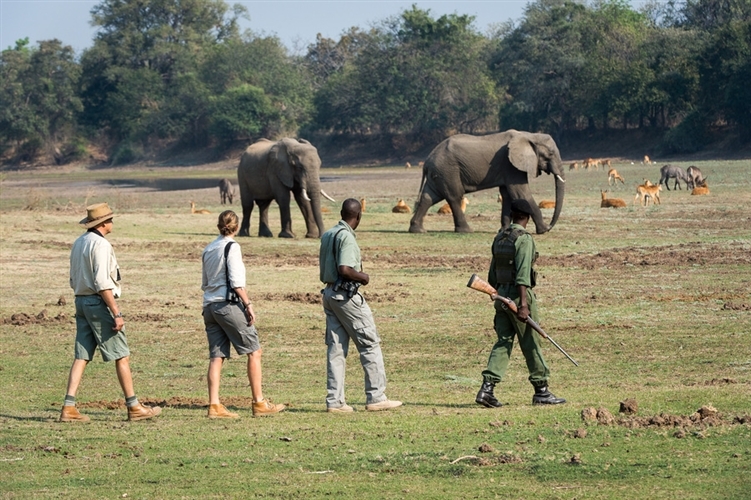 Nkwali is located on private land, overlooking the National Park, and enjoys excellent game viewing, which includes leopard, lion and occasionally wild dog. 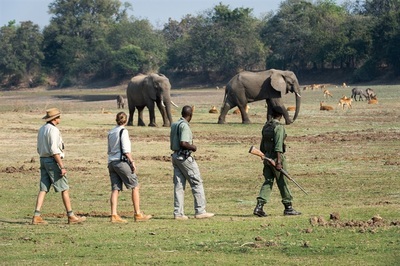 The area is also good for elephants and Thornicroft’s giraffe (an endemic species). 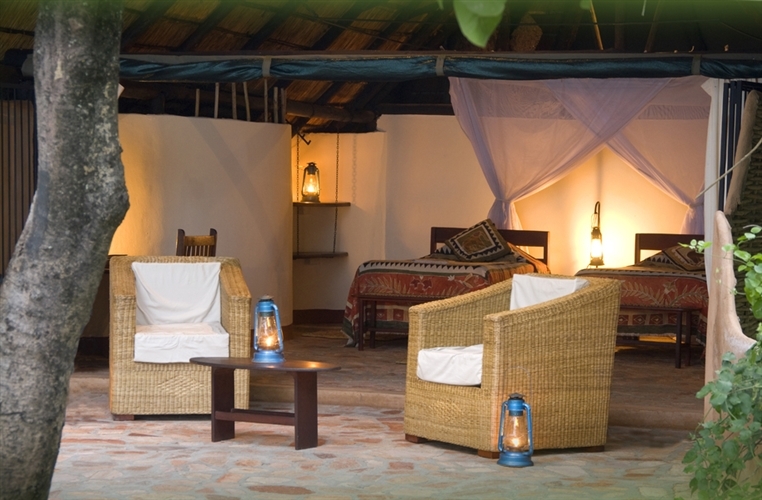 Accommodation at Nkwali Camp is in 5 chalets, all of which are cool and spacious, with views of the river. The front of the room is open during the day and closed by grill doors at night. The en suite bathroom has double sinks and showers. 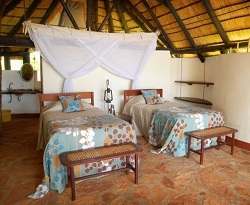 In addition there is a family room with a double and a twin room both of which are en suite. 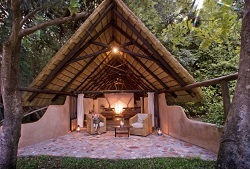 For guests who would like to enjoy an additional level of privacy, Nkwali Camp also has two luxury houses with their own staff, Robin's House and Luangwa Safari House, both of which are available for private rental to families or groups of friends. Nkwali Camp is definitely a ‘camp’ as it is built entirely of natural materials and is designed to be "open" to the surrounding bush. 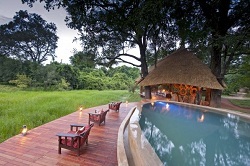 The main structure doesn’t even have walls, to avoid blocking the views.The bar area, set on the banks of the Luangwa River, is built around a huge ebony tree with fantastic views of both the River and neighbouring Park. The open deck is used for moonlit dinners. 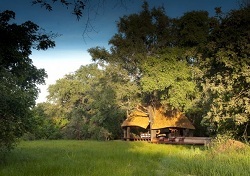 The dining room is a simple thatched structure, next to the lagoon, but most meals are taken under the trees, on the deck or in the bush. For relaxation, there is a swimming pool – great for the afternoon ‘siesta’ period. 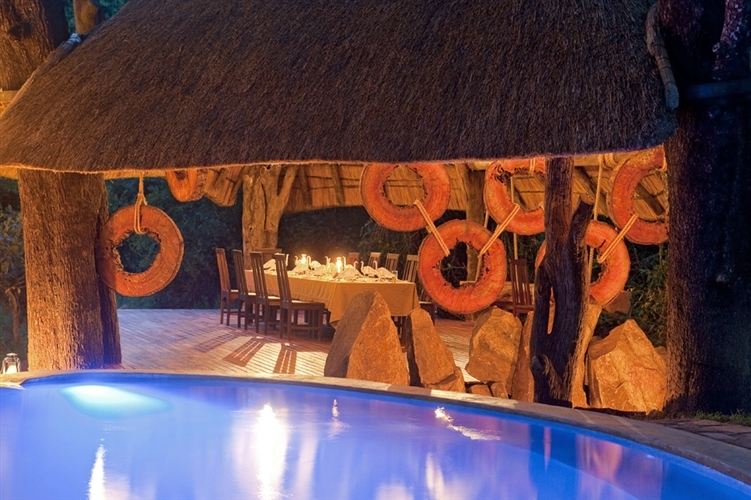 as a wide choice of game drives, walking safaris and night drives, you can also choose to visit Kawaza School or stay overnight at Kawaza Village, the award-winning community project.